Cox College’s revitalization campaign has received a major boost with a $1 million matching grant from the J.E. and L.E. Mabee Foundation, Inc. 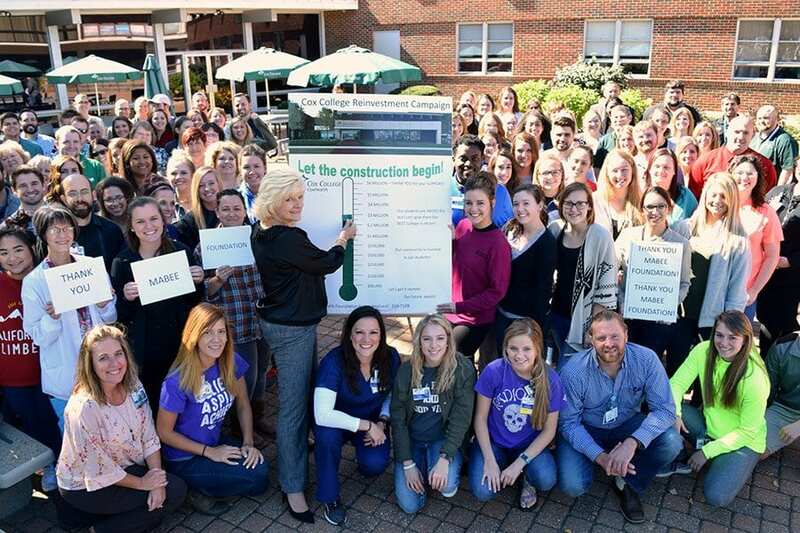 The grant greatly aids the college’s $6.6 million campaign goal, which will completely renovate the five-story college located adjacent to Cox North Hospital. Ultimately, the project seeks to help recruit and retain quality nursing and health science students to the Ozarks region. In order to receive the grant funding, Cox College must raise an additional $1 million to match it within the next year. However, Alexander is optimistic about what can be done in that time period. Announced in July 2017, the college’s revitalization campaign’s ultimate purpose is to train more health care professionals in southwest Missouri. By renovating the college’s historic home, leaders hope to raise the cap on how many nursing students the college is allowed to accept. Raising that level helps infuse more professionals into the community, and also helps the economy by graduating up to 150 more students who will earn professional level salaries. Such change is what the J. E. and L. E. Mabee Foundation, Inc., likes to support. A private charitable foundation, the organization was formed in 1948 by Mr. John E. Mabee and his wife, Lottie E. Mabee, with its office in Tulsa, Okla. As stated in its charter, the purposes of the Foundation are to aid Christian religious organizations, charitable organizations, institutions of higher learning, hospitals and other organizations of a general charitable nature. From the date of its inception through the most recent fiscal year, grants paid by the Foundation to various educational, religious and charitable institutions have totaled in excess of $1.1 billion. For more information about the campaign or to donate, call 417-269-7109.